Coffee cakes are a wonderful category of baked good because they give you a license to eat dessert for breakfast. Coffee cakes are not typically frosted, instead they are frequently topped off with streusel for extra sweetness and texture. This Blackberries & Cream Coffee Cake is a perfect weekend coffee cake that skips the streusel in favor of a vanilla cheesecake topping that is the “cream” to contrast with the sweet-tart berries. The coffee cake starts out with a simple vanilla cake batter, which a generous amount of blackberries are folded into before it is poured into a baking pan. You can use fresh or frozen berries in this recipe. If you are using frozen berries, do not defrost them before stirring them into the batter. You may also want to prepare the topping first so that the cake doesn’t have to sit out for too long before going into the oven. Fresh berries are a great choice when they’re in season. The topping is a cheesecake-like batter that is poured in a thin layer over the batter before baking. The ingredients are the same as those that you would find in a cheesecake, but it is much thinner than an actual cheesecake filling would be. This allows the cream cheese layer to be poured evenly over the cake batter and not to sink down into it during baking. Since the cheesecake covers just about the entire cake beneath it, it can be difficult to tell if the cake is done just by looking at it. Fortunately, you can still slide a toothpick into the center of the cake to check that it comes out clean. The outer edges of the cake will also start to turn light golden and will pull away from the sides of the pan slightly. The cake should be allowed to cool completely before slicing and can be stored at room temperature or in the refrigerator before serving. This coffee cake is a lot of fun to bake and to serve. 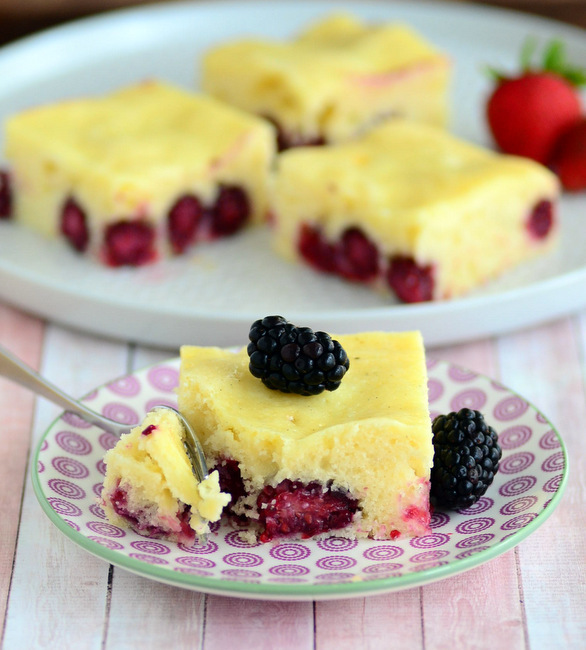 It has a great vanilla flavor in both the cake and the cheesecake, which really compliments the blackberries in the batter. I also like how the berries add big purple bursts of color to every slice. This is an easy dessert to put together and you can adapt it to work with different berries, as well. Raspberries, blueberries and even strawberries can be substituted for the blackberries – or you can use a berry blend to mix things up. There may not be streusel on this cake, but it is still sure to be a hit at your next brunch. In a large bowl, whisk together flour, baking powder, salt and sugar. In a medium bowl, whisk together melted butter, buttermilk, eggs and vanilla extract. Add buttermilk mixture to the flour mixture and whisk until completely combined. Stir in blackberries and pour batter into prepared pan. Prepare topping: In a medium bowl, beat together cream cheese, sugar, egg and vanilla until very smooth. Pour over cake batter, trying to cover as much of the cake as possible (it is ok if it is not completely covered in spots). Bake for 36-40 minutes, or until a toothpick inserted into the center comes out clean. Allow cake to cool completely before slicing. I love blackberries! This cake looks delicious and perfect for the weekend!